Dentistry for children Deciduous teeth treatment. Deciduous teeth need the same way of treatment like permanent teeth. We need to keep these teeth until child is 13–14 years old. Beauty and health of permanent teeth depends on the health of lactic teeth. Adults often forget about treatment their children’ teeth. Big mistake! Why? 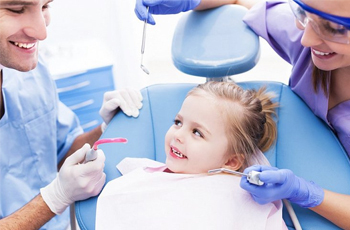 In Miserante Dental our staff can heal your children’ teeth problems. We use modern and biocompatible materials, very esthetic and easy to use, prepared especially for lactic teeth. We also work with root canal treatment in deciduous teeth, to keep root of permanent teeth from growing up. When ordinary ways failed – we need to extract teeth. Under local anesthesia we extract it and make special space retainer to keep place for permanent teeth.